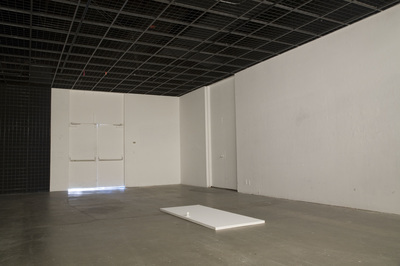 Latex paint, door, ceiling elements of the gallery. See MFA thesis process text below. I consider my work to be an operational practice that is used in response to an environment or object. This practice is a physical process of image-making that dismantles and reconfigures the site. I am interested in producing an aesthetic experience that challenges the normal use and interpretations of a chosen site. My thesis show 10D3 / black or white or black and white / Infrastructure and Display or This is not a pipe was a site specific work which I will use to discuss my practice, ideas and influences. Two art historical reference points that illuminate my work are the Surrealists notions of the “marvelous” and the work of institutional critique strategies of using a site against itself. As a theoretical lense I will review a recent article titled “Jokes and Innovative Action: For a Logic of Change” in January 2008 issue of Art Forum by Paolo Virno which discusses the mechanics of jokes as an example for innovation in human behavior, the application of rules and ultimately the formation of new rules. Paolo Virno, in his article “Jokes and Innovative Action: For a Logic of Change” describes two contending and collaborating forces: the rule and the “common human behavior of mankind”. Rules are developed largely from common human behavior and seek to guide that behavior in practice. Virno sites Freud saying that “common human behavior” is reducible to basic human drives. At the level of basic human drives language “grafts itself onto instinctual reactions and recognizes them”. For example when we learn the word “cry” that represents an instinctual pain, the word is forever then interconnected with our sensation of pain and further acts as a substitution for it. This intersection of the “instinctual reaction” and the language that attaches to it is a basic instance in the relationship between a rule and its application. Virno highlights the power dynamic between “instinctual reactions” (or human drives) and the system of verbal language. Because language is separate from us our physiological make up and instinctual reactions hold a trump card over language, although it can never become autonomous from it. This is where the Joke comes in. Jokes operate by playing the “common human behavior” trump card over language at the site were language grafts itself onto primal human experience and by doing so reveals a potential for new connections of language to basic human experience. By showing the multiplicity of interpretations of rules either according to different specific circumstances or through a joke Virno advances a model for innovation and the possibility of new rules. In 10D3 / black or white or black and white / Infrastructure and Display or This is not a pipe I seek to access a similar territory where language attaches itself to basic human experience both in the experience for the visitor and through the process of making the work. By observing the site and its alterations my intention is to create a complex image-projection reading in the visitor that accesses a similar zone of language and “instinctual reactions” that Virno describes. The alterations are drafted upon an interpretation of the original logic of the site or it’s rules. The original logic of the site is determined by its cultural operations and/or physical functions. 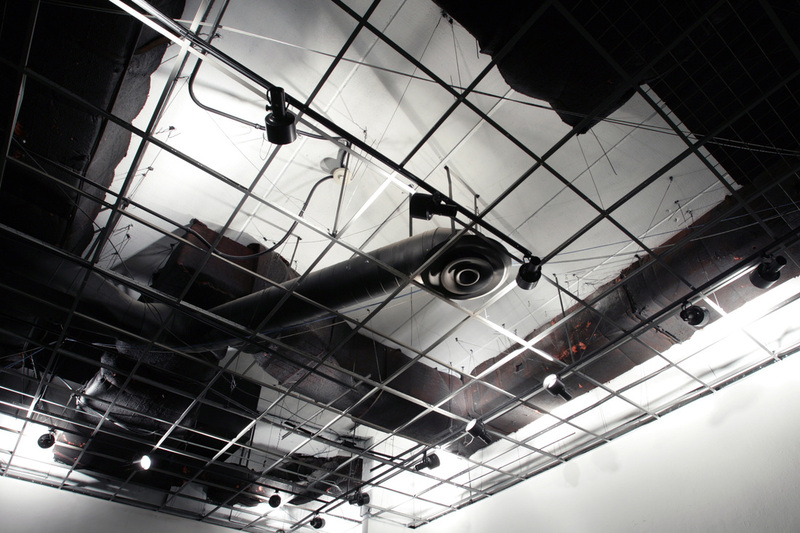 For example in my thesis project 10D3 / black or white or black and white / Infrastructure and Display or This is not a pipe the site masks the infrastructural pipes and ventilation tubes near the ceiling by painting it all black. I determined the original logic in these binary terms: white paint is for display and black paint is to hide. So according to this rule I painted the originally black ceiling white and extended the white walls of the gallery upwards to frame the black infrastructural apparatus to be on display. This is one example in the piece where my interpretation of the rule proliferates a new narrative of assemble/disassemble for the visitor to engage in. This new interpretation reveals the old rule (that black hides the unsightly) while also revealing the multiplicity of ways that this rule can be interpreted towards productive change. It is my intention through the presentation of a narrative process of assemble/dis-assemble to engage the visitor in a act of contemplation that interrogates the changes in the space and their complicity or non-complicity with the rules of the space and a overall highlighting of the ability for subtle rules to proliferate. This again harks back to how Virno describes a joke revealing the multiple and sometimes contradictory applications that a rule can have according to each different situation. A major part of my work has been the process of locating a conceptual context for my impulsive transformative behavior. This includes a progression from having an impulse for a physical change in the environment, arriving at the interpretations of rules based on the site and considering multiplicity of alternatives to shift the specifics of the context. It is important to consider this aspect of my work in relation to the difference with Post Minimalist Institutional Critique artist Michael Asher. Revealing my subjective thinking process as opposed to limiting subjectivity in the work illuminates a strong difference in what otherwise may be initially read as a kinship in practice. 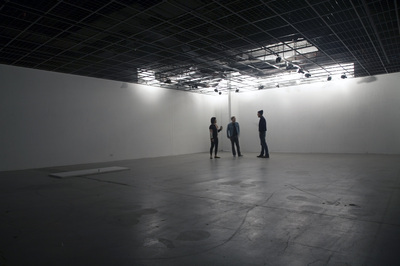 The starting point was being aware of the transparent dropped ceiling in D301 gallery at CalArts. 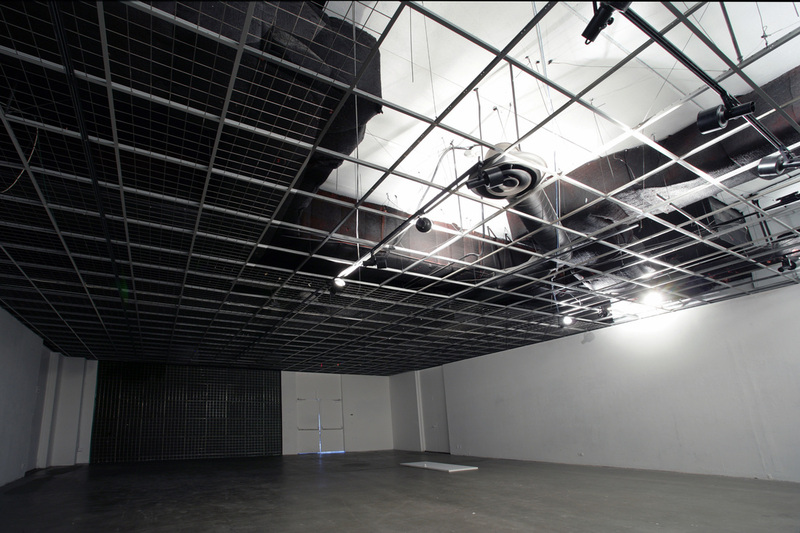 I became increasingly curious about all the infrastructural apparatus that is partially disguised by the dropped ceiling grid and black paint. Ultimately, through my attraction to that which it was attempting to hide I realized that I was looking at that which is not usually looked at and I determined that the spaces primary function is for display. 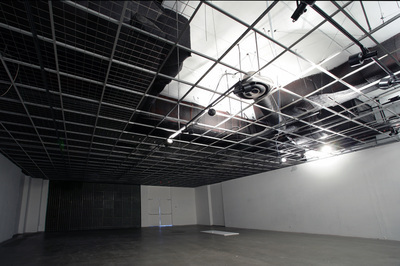 But in the beginning I had no plans to work with the space for my thesis show, I just had and impulsive idea to pant all the pipes and ventilation tubes white leaving the black ceiling and walls white. Months later I choose D301 for my show. I wanted to work with the ceiling idea. I consciously started the project with an image of what I wanted but not an understanding why I was doing it other than I wanted to see it. The advancement of my understanding follows basic fundamental logics that can be considered akin to Virno’s “basic human behavior”. Guided by the desire to produce the vision and a curiosity to explore why it is important and how I could justify it. The basic fundamental logics or guidelines for efficiency were used as a deductive tool to understand why this project was interesting to me. Questions like: how am I going to get up in the ceiling and paint this? Why am I painting and not covering with material? What do I have to move to do this? How long will this take me? I knew I had to remove the grid panels to get to the ceiling to paint it. I knew I wanted to use paint because paint was used exclusively in the space. I then understood it would be easier to paint the architecture to white and leave the apparatus black. 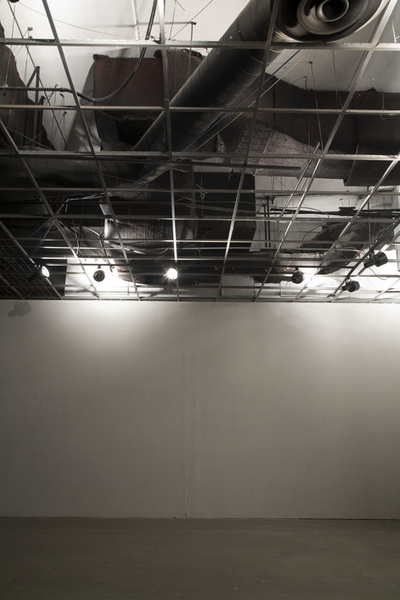 This clarified another logic that I was extending the white walls of the gallery up into the ceiling framing the black apparatus to be on display. As well as reinforcing the basic fundamental logic of efficiency (or Virno’s “basic human behavior”). 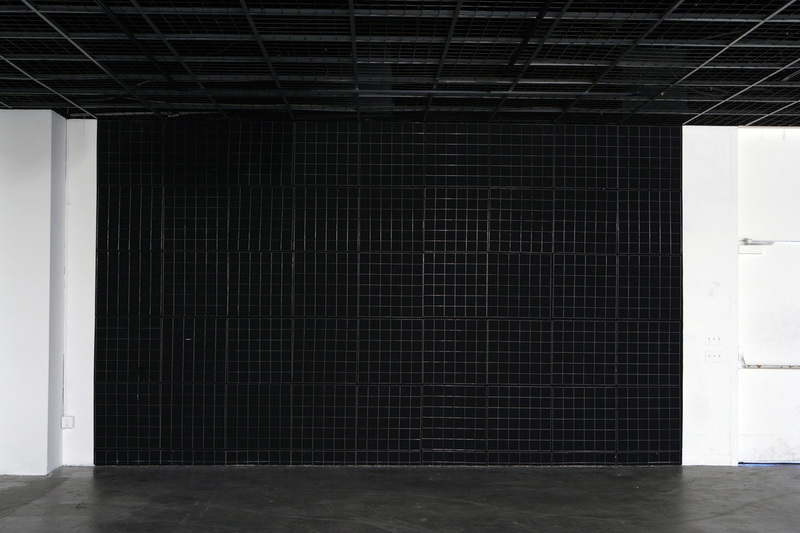 Another logic followed; the grid panels have the power to designate what is painted black, anything behind them can be painted black. So the panels were removed and this element took the longest to figure out what to do with as I didn’t recognize the black paint rule as a guiding one yet. I decided the grids were intended to obstruct vision, so I wanted to leave them out after I painted the ceiling. Also by their nature as modular constructive elements I thought I could reconstruct something with them. They piece together according to a framing support structure to create planes or forms. For a long time I was thinking about building a sculpture on the floor with them. In the mean time I was considering everything in the space. Since I had determined to highlight what is most infrastructural and basic I thought anything in between was up for consideration. The logic of the paint was not yet a guiding logic but rather a touch base to negotiate all other considerations and could still potentially be trumped by a greater logic that has not yet been discovered. I also had it in my head that the space was composed of multiple logics besides the white / black paint. I explored anything that could be named in the space. The security cable ports to extend its capability to anchor cable. The cables length would then be determined by the architecture and it’s distance between the other cable ports. The doors were another major consideration due to the amount of unused doors that are painted white in the gallery space (6) and two others that are functional entrance doors. They resonated similarly with me as the infrastructural piping and vents that pass through the architecture and continue beyond the boundaries that are set by the walls. It wasn’t until I asked the question “why do the doors bother me?” did I find a connection to the black / white logic. I determined that white paint is used for display to frame things and make them visible but it has a strange relation to doors. Once a door is painted white it becomes invisible. 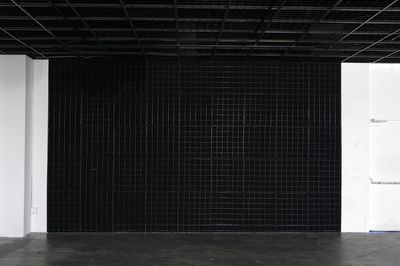 This later connects to the determination of the floor as a degree of infrastructural (black) that becomes display once it has something placed on it. To problematize these rules of the space I decided to place the white (invisible) door on the infrastructural floor and contest both the objectness of the door and the display space of the floor. 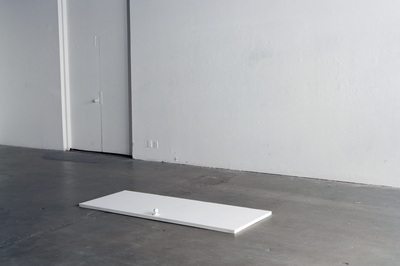 Does the invisible door activate the floor as a display space? If so what does that mean for the other six white doors? The nail holes in the walls I aligned with things you are not supposed to see yet exist in the space. I ultimately decided to do nothing with them since they are already on display on the white wall. The air movement, I considered invisible as well and contemplated ways to make its motion visible. There was an early moment where I wanted to produce associations by visually and physically connecting all the invisible elements that I made visible. This began to change when I made a small decision in an early model of the installation that called for a floor sculptural element to spire up to the ceiling directly under the return vent. The decision was a compositional one: to skew the positioning of the floor spire to be offset from the ceiling vent in order to create a visual misalignment. This brings up an distinguishing quality between my work and the work of Michael Asher, which I will discuss in further depth later, but basically the employment of subjective mannerist decisions rather than the avoidance of the artist subjectivity. I also considered the sounds coming from under the unused doors and I thought to amplify them using a microphone but due to the precedent of not bringing foreign elements in to the composition I decided that it would become evident through the illumination of the vent sounds via a wind chime made of electrical outlets plates and light switch covers. Ultimately the wind chime idea became unnecessary. The damage on the floor was thought to be invisible similar to the nail holes on the wall yet since they were on the floor they would not to be on display and the idea was to find a way to bring them on display. One idea was to stick a long pvc whistle into a divot in the concrete. My thinking was that if the whistle only touched this hole in the concrete floor it would remain invisible and not activate the floor space as display thus not activating itself as a sculpture thus remaining infrastructural and invisible. I did not think dust was within my consideration because it was something brought to the space by forces not evident in the space. For similar reasons I later decided not to utilize the outlets by plugging something in them since I would have to bring something foreign into the space like a blow dryer. The decision the keep it within the economy of the space came earlier before I started working in the space but continued to refine its conditions through the process. The plan for the grid panels was to form them into a large scale architectural model based on the cube (a construction of six panels put together). The model took shape through stacking the cubes. Once in the space a more detailed and elaborate model was possible to produce due to the irregularities of the perimeter grid panels that were cut to 1/6 the size of the original panel size. Small awnings, entrance ways, dividing walls were added to emphasize the reading of architectural model. I realized I was working with two different types of representations. One of architecture scale model and one of a process of altering the specific architecture of the site at a human scale. 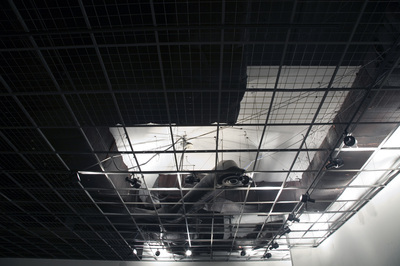 The architectural model was not a direct connection to the space and derailed the narrative of assembly/disassembly. That is when the decision was made to create a mural size representation of the ceiling on the wall activating the visitors experience of the site as a human scale alteration experience. Utilizing a specific site against itself is a strategy that I share with the work of Michael Asher. Asher’s early work focused on the zone of display within the art institution. This work sought to reveal through physical structures the illusion of neutrality by exposing hidden operations within the institutional site. In my thesis project 10D3 / black or white or black and white / Infrastructure and Display or This is not a pipe I also focus on the site display within a specific gallery at CalArts and use the site against itself. Yet, as the title suggests, there are problematizing factors to a straight on institutional critique reading of the work that expands into the strategies of the “marvelous” coined by the Surrealists which I will discuss further on. If the work was a proper institutional critique, the visitor would observe a direct one to one displacement of the elements in the room that reveal hidden operations. This is not the case. Upon closer examination there are many subjective decisions that are revealed. My constructions are mannerist representations of the rigorous rationality inherent to Post-minimalism. One example of this is the problem of missing ceiling tiles in the transference from the ceiling to the wall. 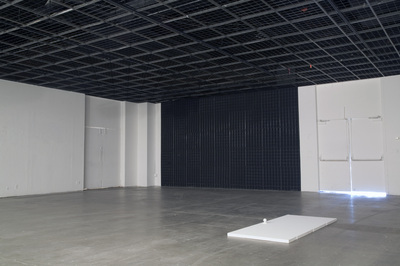 In an initial read one could perceive a direct transference of the removed ceiling tiles to their installation on the wall as a minimalist grid. But the number of tiles in the wall grid account for less than half of the tiles removed from the ceiling. These representations create a theatrical staging that reveals to the visitor not only the hidden operations of the actual site but also the means of this awareness as a subjective network of signs. A key strategy that I borrow from the Surrealist is what they called the “marvelous”. The “marvelous” was considered to be different than the “fantastic”. The “marvelous” linked subconscious expression to social change by maintaining a connection to the “real” where “fantasy” did not. They despised the “fantastic” as impotent and disconnected from reality much like how the post-minimalists consider subjectivity as an interference with the manifestation of a politic at the institutional site. An example of this can again be found in my thesis project with the white door on the floor. A potentially fantastic “Alice in Wonderland” read is continually engaged and defused by a radial reference to eight other pre-existing white doors in the gallery space, implicating and highlighting their presence. The cyclical filtering of fantasy back through a logical reality is the capacity in the “marvelous” to produce change in the world according to the Surrealists. This ability for innovation and change is also echoed by Virno yet he would contend that the fantastic element is a result of revealing the inconsistencies in the application of a rule. Never-the-less both are interested in the potential of a surprising direction in rationality that is infused into socially conditioned context. Last I consider the issue of scale in regards to the site and social space. My questioning of scale develops along the two alternatives provided by the Surrealists and the Post-minimalist. In Post-minimalist strategies utilizing rigorous spatial logic resulted in a localized social meaning about the institution of art and perhaps a “marvelous” visual by-product if all the cards line up properly. The Surrealists attempted to create social change and meaning through subjectivity on a political level at a international scale. These two approaches provide a range of scale for my practice to explore: between the subjective and the social, the site and the object and one institution or a diversity of public, private and commercial places. Although the example of my work is done within the institution of art I do not consider myself limited to this territory and am prepared to provide my practice to larger and smaller social scales and a broadened range of cultural spaces.